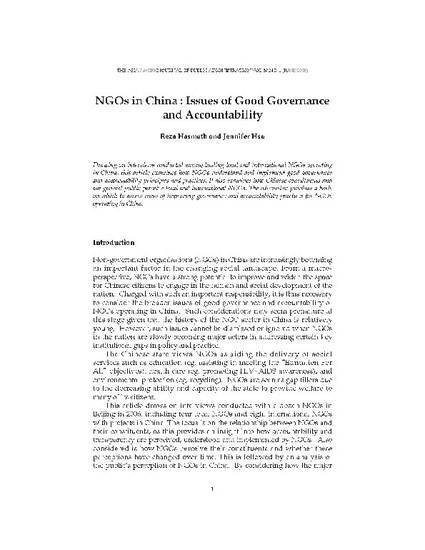 Drawing on interviews conducted among leading local and international NGOs operating in China, this article examines how NGOs understand and implement good governance and accountability principles and practices. It also examines how Chinese constituents and the general public perceive local and international NGOs. The discussion provides a basis on which to assess ways of improving governance and accountability practices for NGOs operating in China. Hasmath, R. and Hsu, J.Y.J. (2008) “NGOs in China: Issues of Good Governance and Accountability”, Asia Pacific Journal of Public Administration 30(1): 1-11.